Lin, Y.-K., Maharani, A.T., Chang, F.-T. and Wang, Y.-C. 2019. 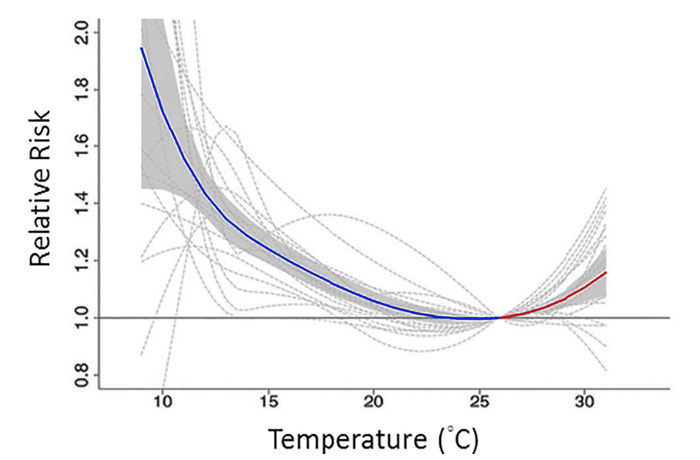 Mortality and morbidity associated with ambient temperatures in Taiwan. Science of the Total Environment 651: 210-217. For several years we have highlighted studies examining the impact of ambient temperatures on human mortality (see the many links posted under the subheadings of Health Effects: Temperature in our Subject Index). The newest publication to investigate this topic is that of Lin et al. (2018). Applying a distributed lag non-linear model to pertinent temperature and mortality data obtained from multiple cities and counties across Taiwan over the period 1995-2008, the four Taiwanese scientists estimated the cumulative relative risk for all-cause mortality associated with extreme temperature events. Their chief findings are presented in the figure below. As illustrated there, the relative risk of all-cause mortality increases at both ends of the temperature spectrum, but the increase is much greater for cold temperatures than it is for warm temperatures. In fact, Lin et al. calculate the country-wide relative risk of mortality due to cold (at the 5th percentile of temperature) is a whopping 1.71, whereas it is a much smaller 1.10 due to heat at the 95th percentile of temperature. It is also worth noting that the temperature associated with the lowest mortality risk is 26.4°C, which falls at the 65th percentile of temperature. All else being equal, one might assume that the minimum mortality risk would occur at the 50th percentile of temperature, with an equal number of deaths above and below the average temperature value. Yet because the minimum mortality risk in this study falls at the 65th percentile of temperature, it would appear that Taiwanese citizens are better adapted to warmer temperatures than colder ones. The simple take-home message of this study, however, is that cold kills, and that it does so far more efficiently than warmer temperatures do. As described by Lin et al., "exposure to low temperatures can stress the cardiovascular system due to blood pressure fluctuation and hematological change, leading to cold-induced vasoconstriction and consequent loss of plasma fluid, predisposing the exposed subjects to arterial thrombosis." Consequently, we should all hope for a little global warming, which would likely help prevent a multitude of cold-related deaths, while having a net positive influence on human mortality. Figure 1. Relative risk of all-cause mortality associated with ambient temperature integrated for all of Taiwan (bold blue and red line) and for area-specific (city or county) locations (grey lines). Source: Lin et al. (2018).